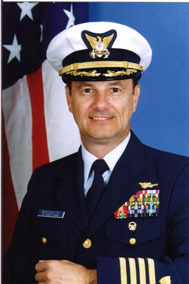 Captain Larry Brudnicki is the Perfect Speaker to motivate and inspire audiences. His presentation style is fast paced and interesting, striking a perfect balance between humor and real-life drama, as he tells a true story of leadership, teamwork, courage and risk management. He is the real-life Captain of the Coast Guard ship Tamaroa that performed two dramatic rescues during the worst storm in more than 100 years, which became known as "The Perfect Storm" and inspired the book that was on the NY Times best-seller list and the blockbuster movie. You have seen Captain Brudnicki on ABC, The History Channel, The Learning Channel, Discovery, The Travel Channel and The Weather Channel. Listen to his first hand account of how he made life and death decisions, and motivated his crew to perform their best in conditions that are beyond imagination.His presentation is inspiring and uplifting. Why do Corporations, Associations & Organizations hire Captain Brudnicki?